From earliest times incenses fulfilled people’s homes, bringing excellent mood and making them feel better. There are many traditional ways to diffuse oils, since aromas have been used in carrying out versatile rituals and ceremonies in many different cultures of the world. But today we’d like to review a list of 10 most contemporary ways to fill our homes with pleasing odors. Scented candles will help you create romantic or even intimate atmosphere. Such a tempting ambience is especially welcomed when you need complete relaxation, especially in the bathroom or bedroom. Using scented candles, you should bear in mind that there’s no use to light a new candle right before your guests arrive. Its surface needs time to melt and start giving out pleasant odors. Remember to do this an hour or two before the party. And afterwards, even if you light a candle once again for a short while, the aroma would come back pretty quickly and would be quite saturated. FYI: a sachet – is a small bag placed in the bedding to perfume it. Most commonly, it is filled with firm aromatic ingredients. They are sewed in a piece of natural fabric, which perfectly keeps aromas within a long period of time. However, it’s worth mentioning that nowadays sachets are produced from different contemporary materials. For example, they can be made from special paper and filled with mineral powder slathered in essential oils. Scent bags are commonly used in walk-in closets, wardrobes and chests of drawers to give the linen and clothes marvelous and unobtrusive aroma. By mixing versatile spicery, herbs and essential oils in perfume cushions you can create versatile aromatic compositions named “potpourri”. All you need is just an appropriate container, such as a basket, a vase, or even a tray, and some imagination and willingness to experiment and create your own home aroma. 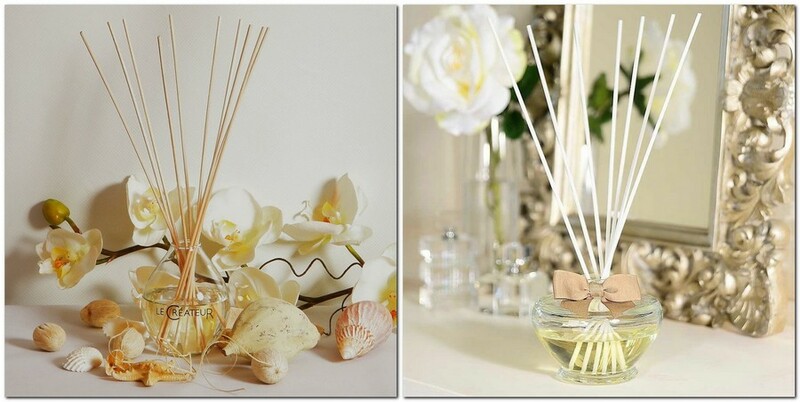 Diffusers are, perhaps, the most convenient and simplest way to perfume the space and the top-trend in the industry. All you need is a bottle with aromatic composition and several reeds to insert. You don’t need to first burn and then put it out. Neither you need to watch it or check for safety reasons. You just put a diffuser in a cozy nook and enjoy its pleasing aroma. If the scent is too saturated and obtrusive, just remove a few reeds. If the smell is too weak, because you didn’t use the whole set of reeds – add a few sticks. If you put all the reeds, but need a stronger scent still – turn the reeds upside down. But these operations are not made on a daily basis – just once in three months. This is the typical period of use for an average 200 ml diffuser. By the way, this home aromatherapy tool is used by many Hollywood celebrities, including Cameron Diaz and Madonna.